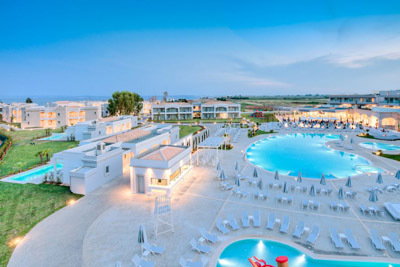 Visits its capital city of Kefalonia, Argostoli to feel the heart beat of the island and the seaside traditional villages of Fiskardo, Assos and Sami to enjoy their beauties along with the local’s warm hospitality. Pay a visit to the archaeological sites and museums to get an insight on the glorious past of the island, or visit Saint Gerasimo’s church to reach the spiritual paths of Kefalonia. 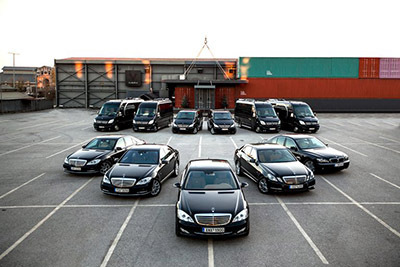 Luxury hotels and spa resorts, most of which offering high quality conference facilities can ensure a dream stay at the island. 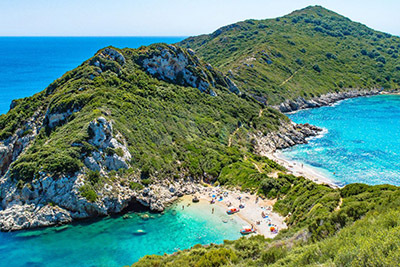 The national park of the island is where eco-tourists can enjoy the natural beauty of Kefalonia, while the countless beaches offer several water sports for fun and relaxed holidays. 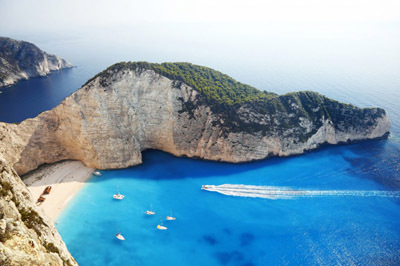 Also ideal for caving, horse riding, as well as religious tourism, Kefalonia is an escape to tradition, culture, legend and mythology and an ideal yachting destination to offer memorable vacations. 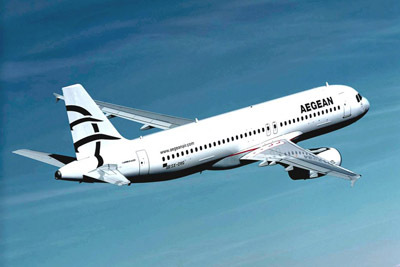 The island of Kefalonia can be easy reached by air or sea, being highly visited therefore offering several routes daily. 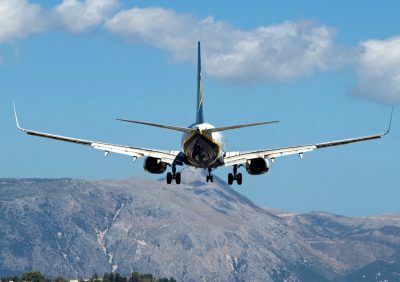 By air the Airport of Kefalonia connects daily with Athens, with available routes also to Thessaloniki as well as other Ionian islands, with several routes within the week. 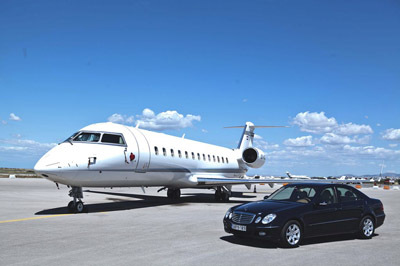 During the summer period low fare and charter flights reach the island to provide services to the increased number of visitors. The port of Argostoli links with the mainland through Kyllini and Patras, while local boats for visiting the neighbouring islands are available in several small ports of the island. 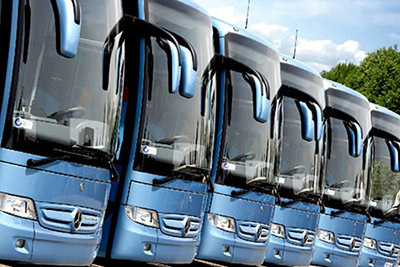 The national bus services link with the island through Patras, while a car hire is a good option when interested in exploring the island. The capital city of Kefalonia, is Argostoli to initially host the island’s main port since 1757. 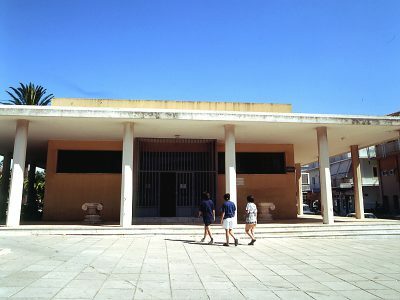 The former Venetian architecture of the whole island was destroyed by the earthquake of 1953, to turn Argostoli to the commercial and touristic centre of the island in a modern and cosmopolitan way. A stroll along the palm-lined coastal road, paved with colourful sea pebbles, Plateia Valianou, the town’s central square, the commercial Lithostroto Street lined by shops, and also features the Saint Spyridon Church and the clock tower of Camapan Square. In addition to its cafes, shops and tavernas, Argostoli is home to some of Kefalonia’s best museums, including the Archaeological Museum of Kefalonia, and the Korglalenios History and Folklore Museum. Assos on the other hand is a small village full of whitewashed buildings and houses, to also host an imposing Venetian fortress, offering a scenic setting alongside the peninsula. 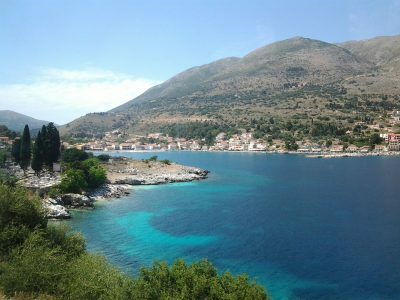 The only area of Kefalonia to remain untouched after the big earthquake is the village of Fiskardo, to boast its beautiful Venetian buildings and attractions, as well as some ancient remains. 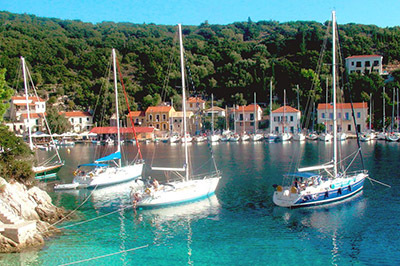 The beauty of Fiskardo and its wonderful little port has become a top destination for yachters. Finally Sami is a resort village to offer all the amenities required for tourist vacations, with beautiful hillsides and natural attractions and monuments such as a number of monasteries, some remains of an ancient fortress, walking trails, several beaches and even some surprisingly large caves. The Archaeological Museum of Argostoli is a must-see for everyone hosting findings from the prehistoric era. The three galleries of the museum, exhibit finds form Sami, Fiskardo and Skala and Melissani Lake dating back to the Paleolithic and Neolithic period, such as tools, pottery, jewelry, ceramics and precious miniature vaulted tombs from the Mycenaean period. Exhibits from grave excavations from the Mycenaean period to prove the prosperity of the era and a mosaic from the temple of Poseidon are some of the most important exhibits. Several ancient graves are found in this island of historical importance such as the Graves of Lakythra and the Graves in Mazarakata, both to reveal extraordinary and well preserved finds, but the Mycenaec Grave in Poros is of the highest significance. Situated in Broutzi, is the greatest in size beehive-type tombs of the area, reserved for the ancient Greek royalty of that time. Built in a rocky flat of a hill, it has a 7m diameter and its finds reveal the existence of a strong Mycenaec civilization. According to the legend, it is said to be the grave of Odysseus himself as a gold jewlery to resemble Odysseus’ gold brooch was found here. At the area of Skala, remains of a Roman Mansion where excavating with highly impressive and well preserved mosaic floors to illustrate human and animal figures, the adjoining baths and interesting inscriptions, all dating back to the 3rd century B.C. Finally outside the village of Razata, one can find the remains of the Cyclops Walls constructed during 7th -6th centuries BC with original length of 4km. Taking their name by the gigantic rocks to structure it, the walls were used as a fortification system of the ancient city of Kranis to be the dominant city of the island for over three thousand years, providing valuable information regarding the art of the fortresses from Mycenaec era. 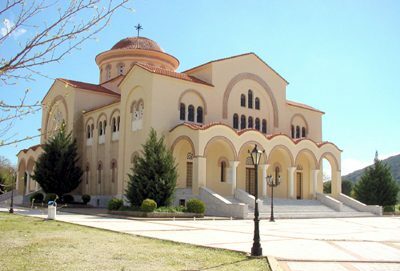 Other than the archaeological interest of the island, Kefalonia is also a top destination for religious tourists who will find a lot more than what to expect at Agios Gerasimos church, monastery and cave. St. Gerasimos, the patron saint of Kefallonia, was an offspring of the aristocratic family of Notarades from Trikala and inhabited in Kefalonia in 1559 after practicing in Jerusalem, where he stayed for five years in the famous cave of Lassis. In Omalos, a beautiful location surrounded by vineyards, he founded his monastery of stunning architecture as an honour to Virgin Mary. Adjacent to it is the church full of precious icons, chandeliers, and ornate pictures to tribute the life of the saint, while at its bottom is the cave, his burial area to be reached through a tiny path, which can be surprisingly accessed by any sized – person where it is said that the one who exits the chamber with not a singe fleck of dust on ones clothes, is a sinless man. The most important part of this visit is the incorruptible body of Saint Gerasimos and his relic, both saved inside the monastery. There are two processions of the Saint’s relics within the year, one on the date of his death, 16th of August and the second one on October 20th, the day of the translation of his relics, which is actually his official celebration. 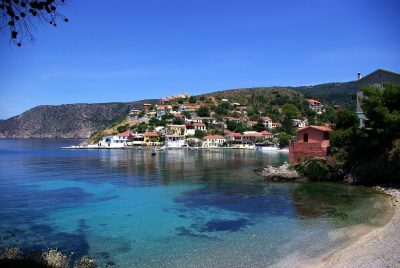 Kefalonia is an endless field of myriad things to do and enjoy, satisfying all kinds of visitors. The morphological diversity with rich vegetation, a national park, caves, canyons and rivers, offer a wide range of outdoor activities. The national park including the tallest among the Ionian, Black Mountain of Ainos, with its rich flora and fauna that have overwhelmed the area is ideal for hiking in several trails, jeep safari, cycling, mountaineering, bird watching and horse riding, while Fteri canyon will impress the sport’s lovers. Sea related sports such as, sea canoeing/kayaking, stand up padding and diving, can be practiced at most of the organized beaches of the island. Above all, spelunkers are the ones to find the ideal vacation spot at Melissani Cave. It is a unique geological phenomenon, as the natural entrance of the cave is actually its roof, which was discovered after being partly collapsed, contains two chambers. 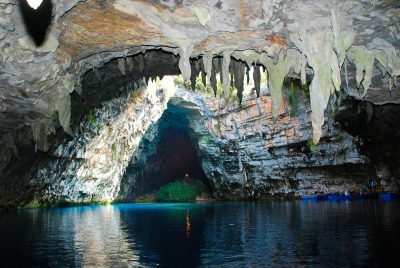 Having a big lagoon on its bottom with water depth ranging form 10 to 40m, the cave can only be visited by rowboat though a man made artificial entrance. As sun comes through the open top of the cave’s first chamber, its rays reflect on the water and the bottom to create amazing turquoise shades to vary in colours giving the illusion that diamonds and sparkles float on the surface of the lagoon. The second chamber has a closed top to feature an islet of archaeological importance as the Ancient Statue of Pan and the Nymph Platter were found here. Stalactites with an age of 20.000 years and odd shapes adorn most of the cave. Nearby Melissani, is Drogarati Cave. Dating 2 millennia back the cave boasts stunning floor to ceiling stalactites and stalagmites growing about one centimetre every hundred years. At a constant 90% humidity, the cave is an eco-system to provide shelter for moles, bats and very rare specie of tarantula. Finally boat excursions, some with glass-bottom cruises offer a great view of the island’s coastline and the neighbouring island of Ithaca, while having the chance – if being lucky-to encounter some inquisitive dolphins. 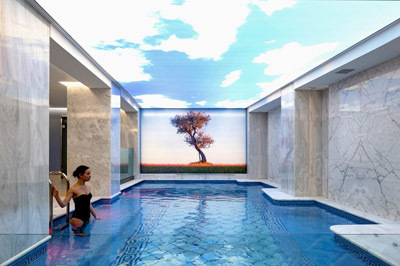 Kefalonia, is blessed with a fertile ground and a wet climate to contribute to the production of high quality products. The production of olive oil in the island is a tradition transferring from one generation to the other, to ensure the maintenance of its unique quality and taste. Kefalonia is also widely known for its wine production since antiquity as according to legend Kefalos, the son of Hermes was the one to cultivate the first grapevine in this island. Robola being the most distinctive and unique amongst the Ionian labels literally grows out of the rocks and is exceptionally fruity and aromatic produces in small quantities. 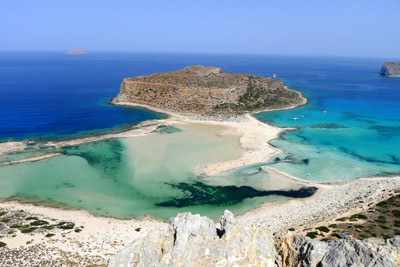 Other varieties are Thiniatiko, Moschato, Vostilidi and Tsaousi, putting viniculture at the centre the local economic activities of the island. Honey is another exceptional product worth tasting once being at the island, offered in two varieties Thymariso and Elati. The local diary products and especially feta cheese is at its best in Kefalonia, where locals boast for being the ones to expand its production around the country. Finally the local sweets Mantoles, Mantolato and Pastelia made of local products are widely offered in local stores and touristic shops. 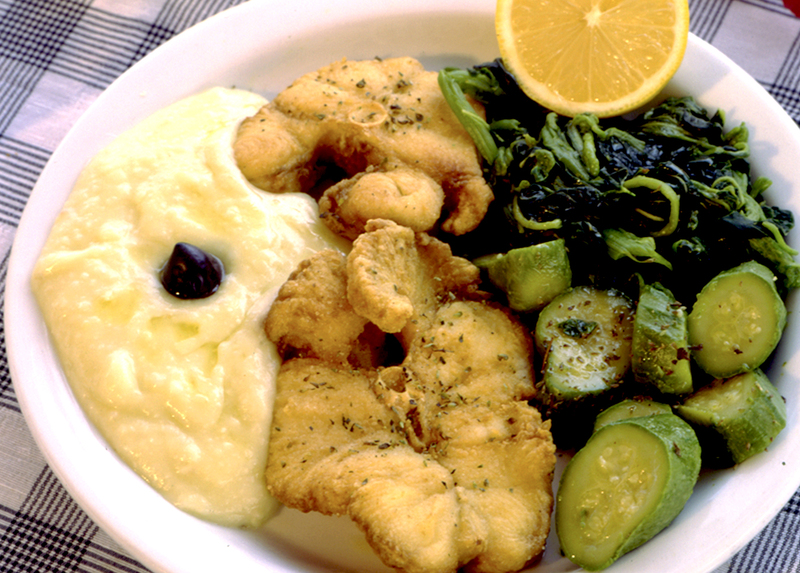 The cuisine of Kefalonia, impresses every visitor with the use of local fresh products and a gastronomic combination of Greek cooking, heavily influenced by its conquerors. Although all kinds of cuisines are available in the island due to the masses of tourists attracting, a taste of the authentic local dishes such as aliada, bouryetto, tsigaria and bourbourelia, as well as fresh fish and seafood, provide a unique gastronomic experience.